Wednesday, April 4th, 2018, Baltimore, MD – Insilico Medicine, a Baltimore-based company specializing in the application of artificial intelligence for drug discovery, biomarker development and aging research, announces the presentation of its CTO, Alexander Zhebrak, at the International Conference on Interventions to Extend Healthspan and Lifespan, April 23, 2018, Kazan, Russia. 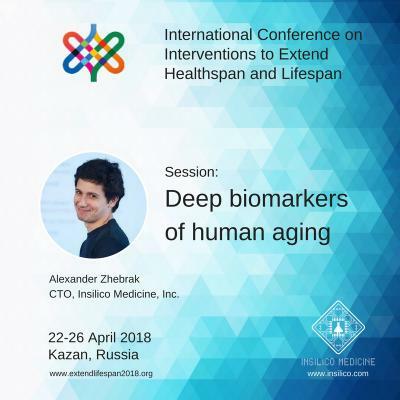 Dr. Zhebrak's session "Deep biomarkers of human aging" will cover the latest advances in artificial intelligence for development of aging biomarkers in humans. The presentation will focus on the applications of deep neural networks to predict human chronological age using common blood biochemistry and cell count data obtained from routine health examinations. "We are very happy to present our work at the International Conference on Interventions to Extend Healthspan and Lifespan, which gathers the thought leaders in aging research and longevity biotechnology. The topic of aging biomarkers is rapidly gaining popularity and we are happy to be at the leading edge of research and one of the innovation drivers in this area", said Alex Zhavoronkov, PhD, the founder and CEO of Insilico Medicine, Inc. The International Conference on Interventions to Extend Healthspan and Lifespan will bring together more than 40 leading scientists to present their research in genomics, epigenetics, proteomics and metabolomics of longevity and aging. The organizers of event aim to unite the thought leaders around the most important issues in molecular mechanisms of aging and development of new tools for aging research and longevity industry. The conference will transpire on April 22-26, 2018. Insilico Medicine is regularly publishing research papers in peer-reviewed journals. It is the first company applied deep generative adversarial networks (GANs) to the generation of new molecular structures with specified parameters and published seminal papers in Oncotarget and Molecular Pharmaceutics. Another paper published in Molecular Pharmaceutics in 2016 and demonstrated the proof of concept of the application of deep neural networks for predicting the therapeutic class of the molecule using the transcriptional response data, received the American Chemical Society Editors' Choice Award. One of the recent papers published in November 2017 described the application of the next-generation AI and blockchain technologies to return the control over personal data back to the individual. One of the latest paper published in the Journals of Gerontology demonstrated the application of the deep neural networks to assessing the biological age of the patients. The most recent paper published in the Oncotarget journal presented the roadmap to enhancing radioresistance for space exploration and colonization.